Agriculture is the lifeblood of Laikipia County, Kenya. Seventy-five percent of households depend on it for their livelihoods, and 60% cite it as their sole source of income. Most farmers in Laikipia County rely on rainfall to water their crops, exposing them to climatic risks that threaten economic vitality and food security. Unfortunately, these trends are echoed across much of Kenya, where only 4% of farmers irrigate their land. Lack of access to modern irrigation technologies constrains agricultural yields, and reduces productivity by forcing many farmers to rely on manual means of crop irrigation. Solar water pumping provides an opportunity to improve agricultural productivity, reduce physical burden, and drive sustainability. In January 2019, the Low Energy Inclusive Appliances Programme (LEIA) met with two farmers in Laikipia County to discuss their experiences with solar water pumps: Daniel Kingori, a former army engineer, and Jacinta Kirigo, a former English teacher. Both Daniel and Jacinta live in the village of Matanya – a small community of smallhold farmers located about 40 minutes outside of Nanyuki, Kenya. Both were selected to field-test a solar water pump – SunCulture’s new RainMaker2 – and a bundle of efficient direct current (DC) appliances, including a television and an electric pressure cooker. Daniel and Jacinta were both glad to leave their manual irrigation systems behind. Prior to acquiring a solar water pump, Daniel used a pulley-driven system to extract water from boreholes, which he would then transfer to water storage tanks. Jacinta relied on a mechanical groundwater pump, and collected rainwater in tanks to feed her sprinkler systems. Irrigating the land manually cost around 3-4 hours per day for Jacinta, and 1.5 hours and 20 buckets of water for Daniel. Both farmers reported an increase in yield after using their solar pump. 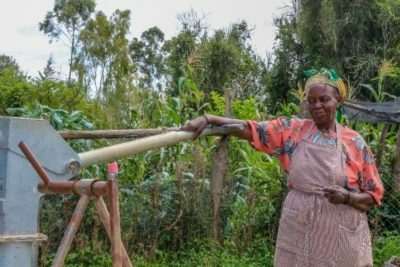 Jacinta Kirigo and her manual water pump. Today, Daniel and Jacinta are experienced solar water pump users, both owning SunCulture’s RainMaker1 as well as RainMaker2, along with other appliances such as solar radios and LED lights. For both, the irrigation and maintenance texts they receive through Rainmaker2’s Internet of Things platform are crucial to the continued management and operations of their farms. For Daniel and Jacinta, one significant aspect of the upgrade to their new solar water pump was the new appliance options it enabled. Daniel and Jacinta’s pumps can both power productive use and household appliances up to 500W. 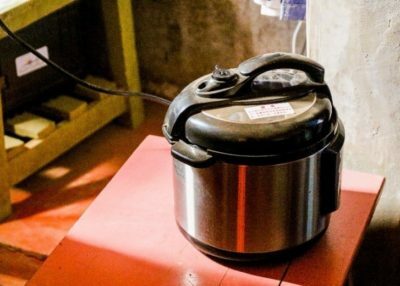 Jacinta uses her new electric pressure cooker to cook around three times a week, with ingredients mainly from her own farm, thus reducing the need to use kerosene or firewood. Daniel reported using his electric pressure cooker for water heating and cooking almost every day. In terms of financing, a bundled financing approach fits the needs of both Daniel and Jacinta. The approach enables the farmers to pay for the package in installments, with an upfront deposit, and owning the appliances at the end of the payment plan. Daniel stated that the $35 monthly payments were affordable, although he considered the price point to be too high for many of his neighbours, suggesting that more scale in order sizes as well as lower prices are still required to increase affordability and uptake. Overall, the effects of being able to reduce the reliance on physical pumping, and access a wider combination of appliances, were positive on a number of levels to both Daniel and Jacinta. However, more research, innovation, and financing are needed to scale the market for solar water pumps. The Efficiency for Access Coalition’s report from the 2018 Solar Water Pumping roundtable estimates that increasing scale for this product technology could enable irrigation to be cost-effective for nearly 500 million small-scale farmers worldwide. This is why the LEIA program is working to raise the efficiency bar and champion the best-performing products through initiatives such as this year’s Global LEAP Awards competition for Solar Water Pumps, with the aim to channel investment toward off-grid product innovation and enable greater scale in the market. To learn more about the role efficient off-grid agricultural appliances play in reducing physical burdens and increasing incomes and productivity of millions of farmers worldwide, follow our new campaign, Efficiency for Agricultural Technologies by using the hashtag, #EfficiencyforAgTech.